Summer at my house means lots of playing outdoors, vacation and of course, popsicles. We go through tons of popsicles, which means that we have tons of popsicle sticks left over every single week. So, I started thinking about what I could possibly do with all of those popsicle sticks and I found 50 amazingly fun popsicle stick crafts that you will want to share with your kids this summer. Popsicle stick crafts have been my favorites since I was a kid. We would always make something with craft sticks at summer camps and Bible schools and my kids love making things with those little sticks as well. I honestly can’t wait to show them some of these projects. From picture frames and airplanes to so many teaching games and activities, you are sure to find a great way to use up those craft sticks this summer. 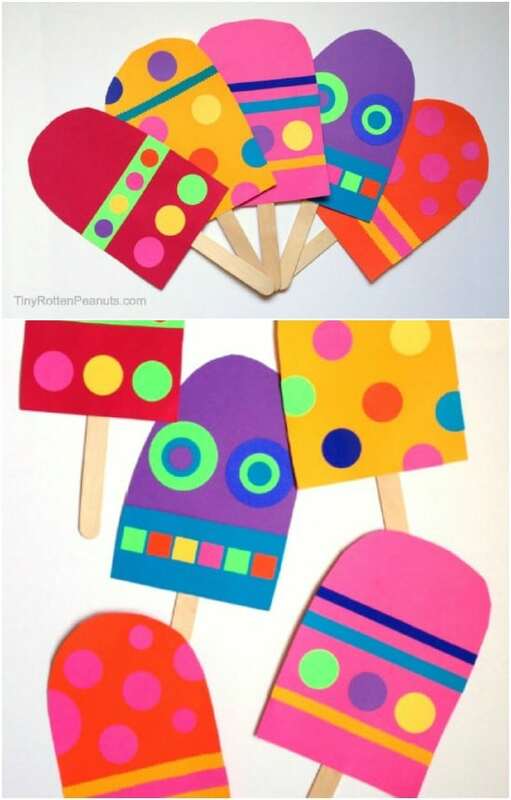 I do love a good craft that doubles as a teaching exercise and may of these popsicle crafts create games that will teach your toddlers and preschoolers so many things. Be sure to also check out these 30 DIY sensory toys and games for your little ones. Part of me honestly dreads summer because I just know that my kids are going to be bored at some point. That’s why I thought these popsicle crafts were such a wonderful idea. They give your kids something to do, especially on rainy days, and when the crafts are finished, they have new toys that they will love playing with all summer long. And, if you tend to have bored children at home during the summer months, you should also check out these 50 fun crafts to keep kids entertained this summer. There is something in here for kids of all ages. Not only will your little ones love making their own flower stems from painted popsicle sticks, they will also love making this flower art. 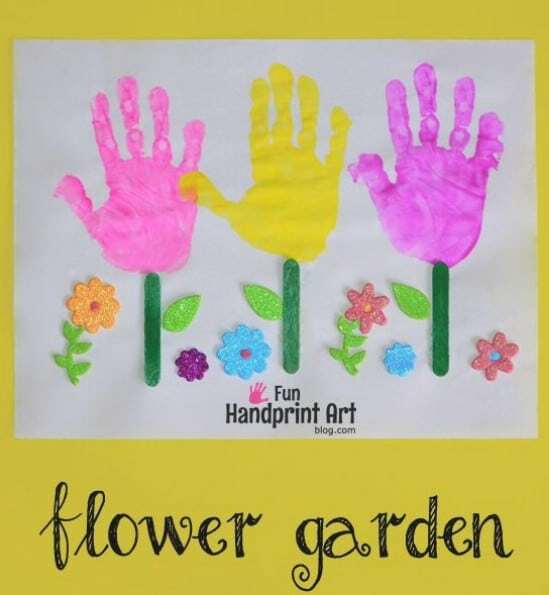 The flowers are made from their handprints – so this is a keepsake for you as much as it is a fun craft for them. And depending on how old your kids are, this one requires very little supervision. 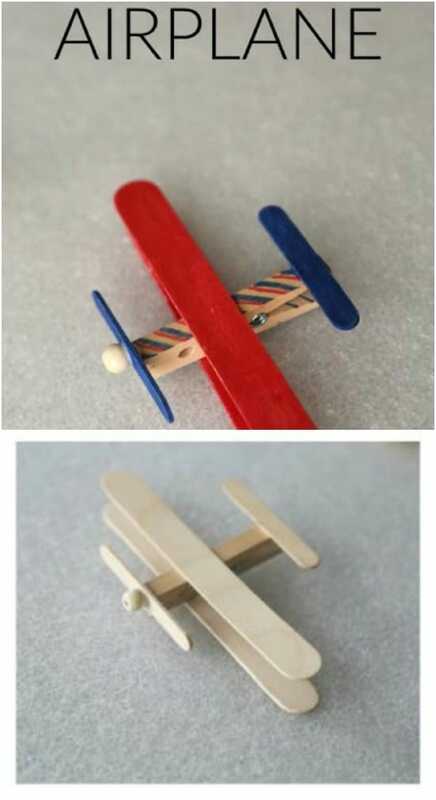 Little boys – and even a few little girls – are going to love making and playing with this popsicle stick airplane. 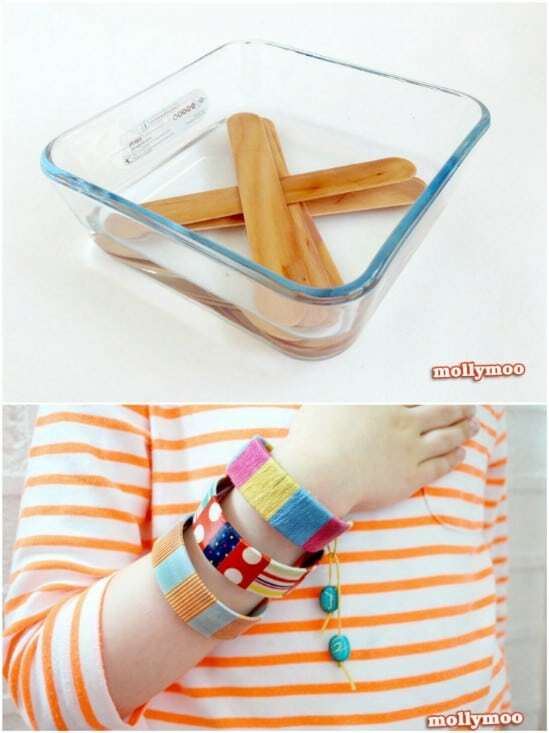 You make this with different sizes of popsicle or craft sticks and wooden clothespins. They can paint and then glue their airplane parts together. This is a great little craft for summer birthday parties! You can make up baggies with all of the supplies and then let them have a blast making airplanes all afternoon. 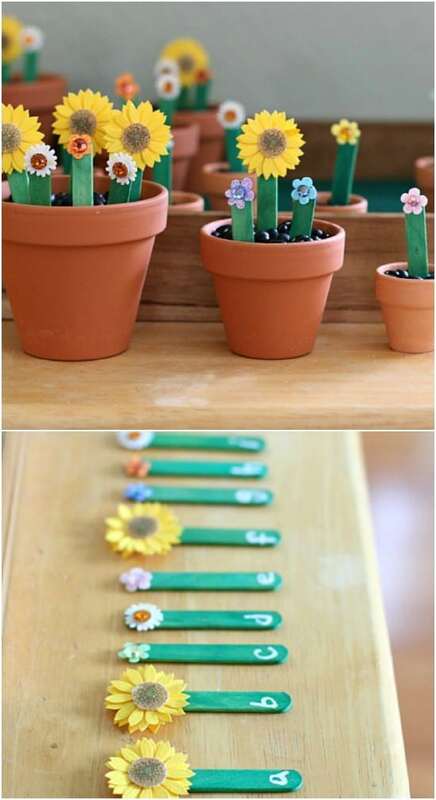 Kids will love making their own little flower gardens, complete with stems made from painted popsicle sticks. You will love that this is also a teaching activity. Your little ones can practice their alphabet with this one and you only need a handful of materials to make it. This will definitely keep them entertained for hours at a time. Avengers are so popular right now – at least they are in my house. 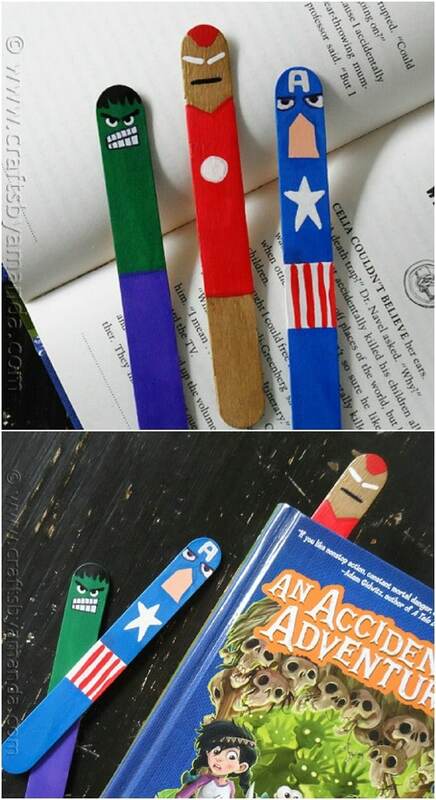 That’s just one of the reasons why I love these Avengers bookmarks that your kids can make from popsicle sticks. They’re also really easy and fun to make. They can choose their favorite Avenger – there are so many to choose from – and make their own bookmark however they want it. Plus, this one encourages them to read! Not only is this a craft that your toddlers can help you to make, it’s also a game that teaches them about balance. It’s a great DIY sensory game and so easy to put together. You need a collection of popsicle sticks, a piece of cardboard, a foam ball and just a few other basic craft supplies. This is a wonderful way to use up those craft sticks and give your little ones a fun summer activity that they can do indoors or out. Definitely add this one to your list of DIY backyard games this summer. 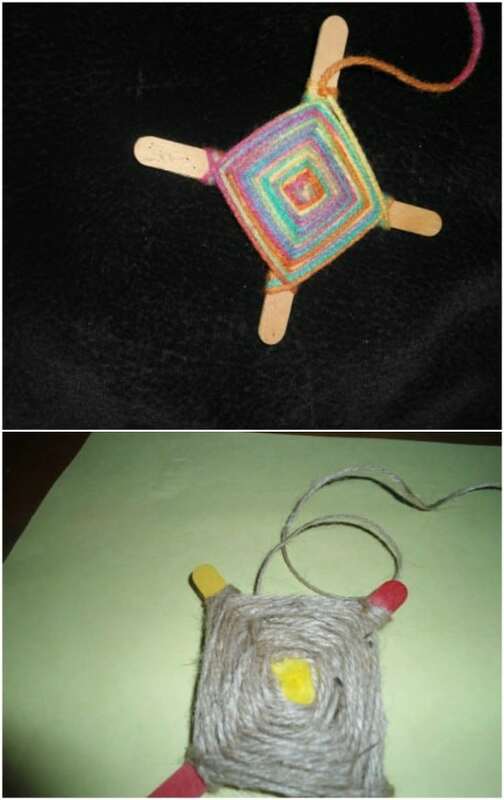 Now, this is probably a craft for little girls, although boys could do it as well, if they wanted. They could maybe do the stick people a bit less girly. 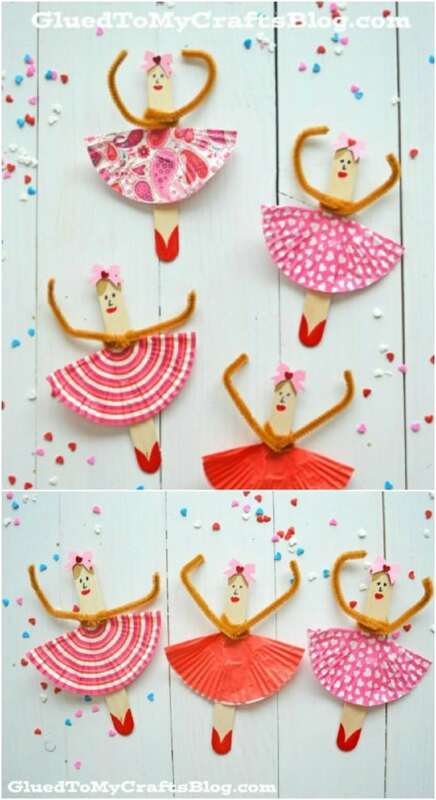 You need a collection of craft sticks and some cupcake liners to make these cute little ballerinas. You will also need some paints – washable paints will work beautifully and be less messy – and a few pipe cleaners for this one. 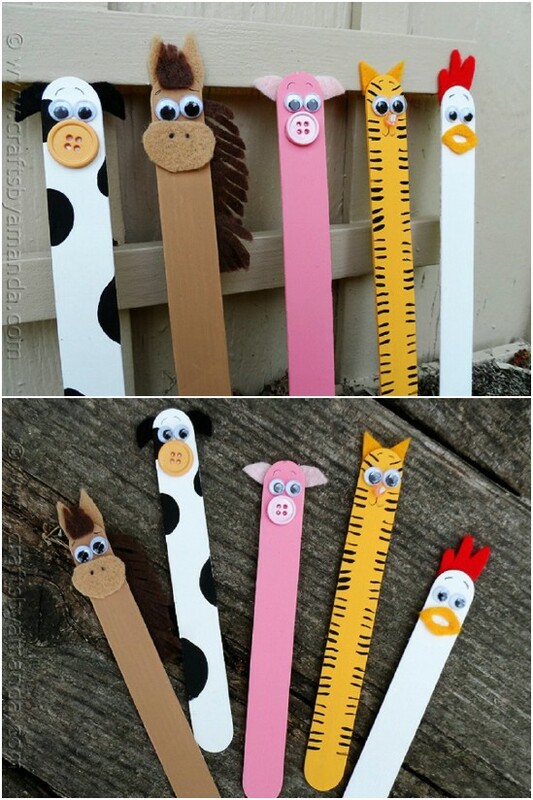 Kids love barnyard animals and they will really love making their own with their popsicle sticks. You can help them to paint the sticks the appropriate colors and then let them use their imaginations to create horses, cows, pigs, chickens and any other animals that they love. They could also do zoo animals with this – you just need paint, craft sticks, and google eyes, buttons and felt. 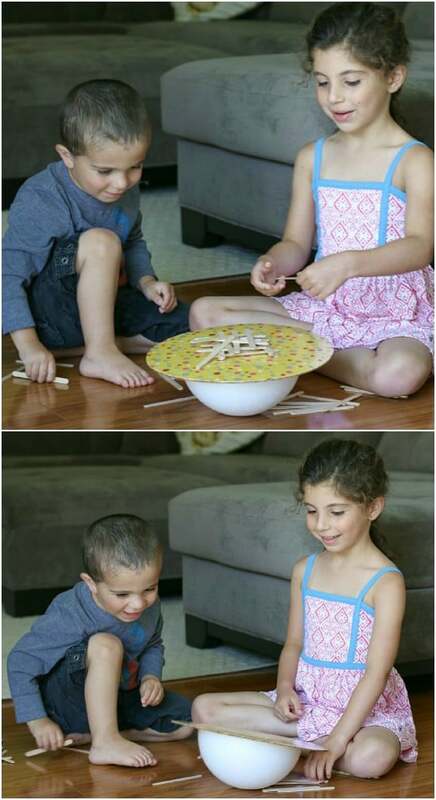 Here is another fun popsicle stick project that gives them something to make and then something to enjoy playing with for hours at a time. 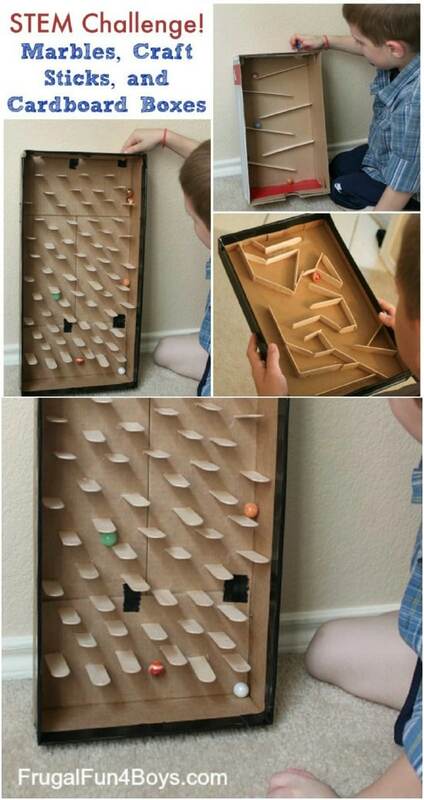 This marble run is easy to make from just an old cardboard box, a few popsicle sticks and some marbles. This is a great project for repurposing cereal boxes or you could use any cardboard box that you may have on hand. Popsicle stick picture frames are such a traditional craft stick project. I remember doing these in school. They are so easy and so much fun to make, and your little ones can decorate them however they want. Use the DIY frames to house their favorite summer photographs or you could make them even bigger than normal and use them to showcase their artwork. 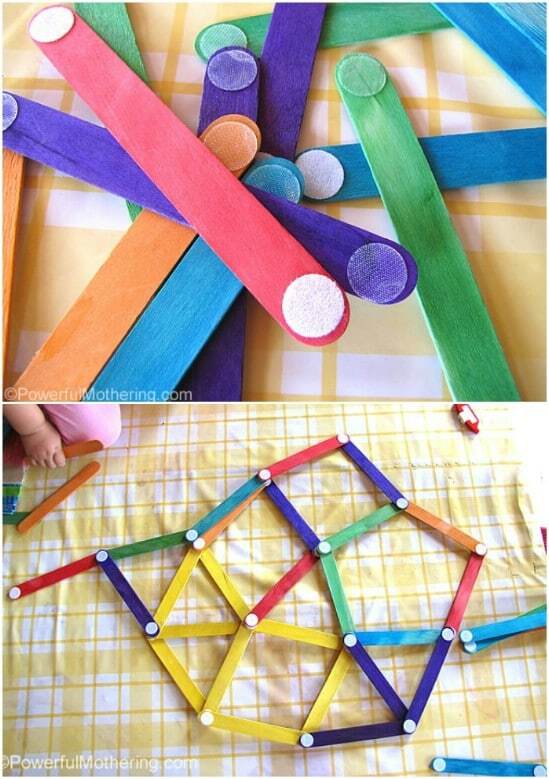 This DIY game is made from craft sticks and it is just as much fun to play as it is to make. 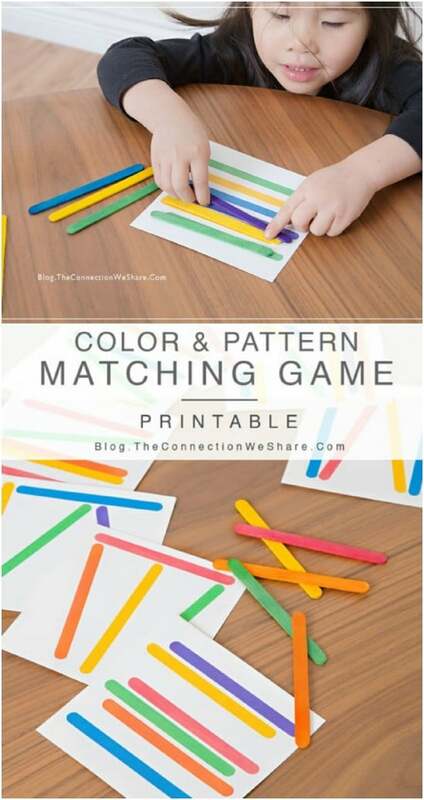 Your toddlers are going to adore helping you to create the different colors and they will have hours of fun learning how to match those colors when the game is finished. I love a good craft that also serves an educational purpose and this is definitely one of those projects. 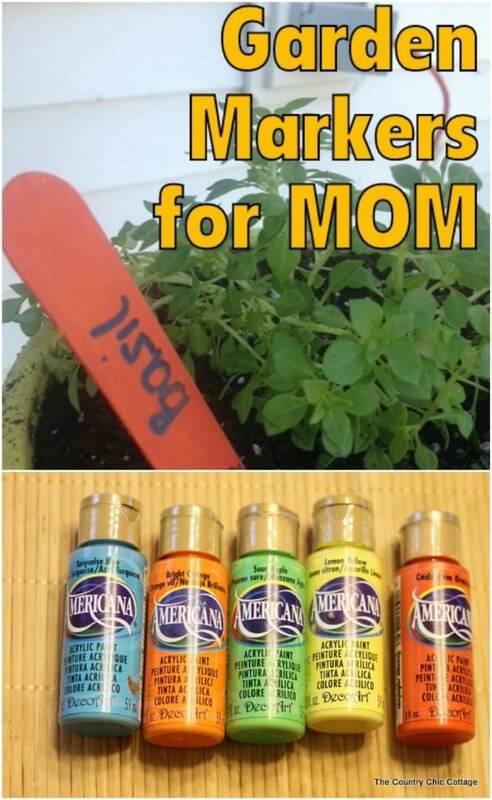 Give your kids a lesson in nature while letting them enjoy a fun and creative craft stick project. 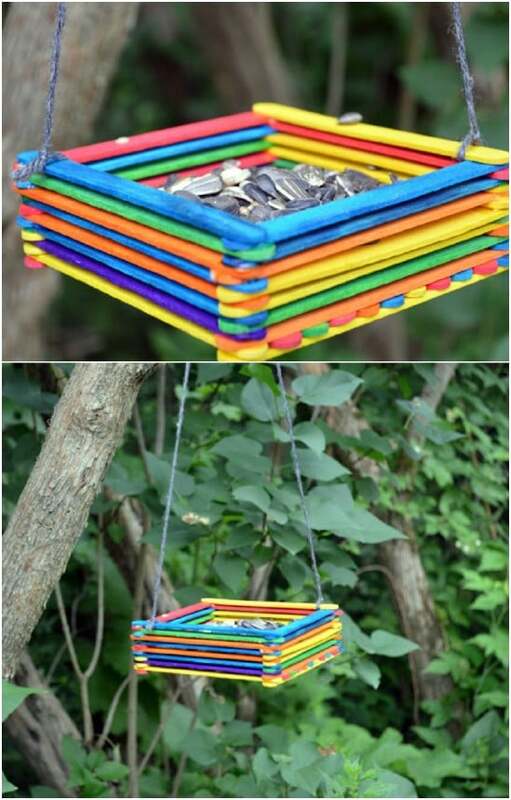 This DIY bird feeder is made from popsicle sticks – and they can paint them various bright colors to make it even more fun. They just create the feeder by stacking and gluing sticks together and then fill it with bird seed and hang from a tree or the front porch. Your kids can use those popsicle sticks to make their own giant popsicles. This is a great craft project for rainy days or when it’s just too hot this summer for them to go outside and play. They just take their popsicle sticks and use them as actual popsicle sticks for these large paper popsicles. Let your little ones have a blast creating their own water color sculptures. They make these sculptures from popsicle sticks that they can paint in any number of colors. 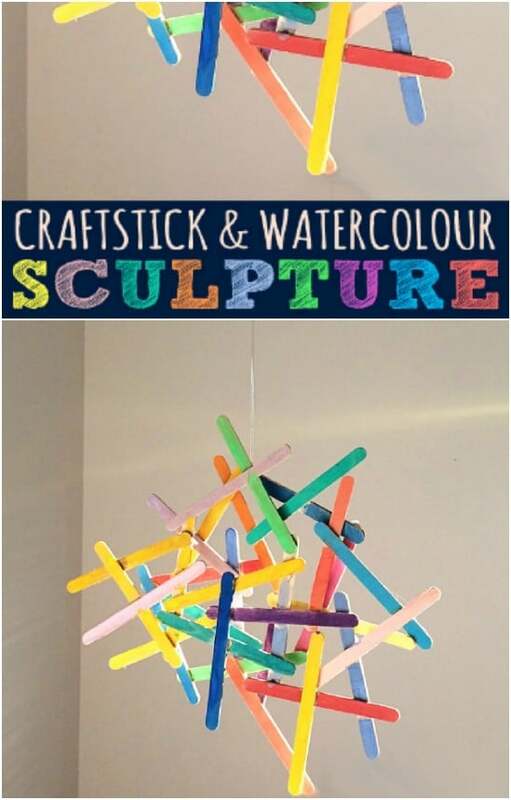 Then, they assemble them into a sculpture that you can hang on the fridge – just add a magnet to the back – or anywhere in the house with a bit of yarn or twine. These are so much fun to make! your kids can decorate them with paint, yarn, stickers or any number of other embellishments. Who says you have to spend a fortune on toys for your kids? You don’t and your kids can even help you to make their toys. 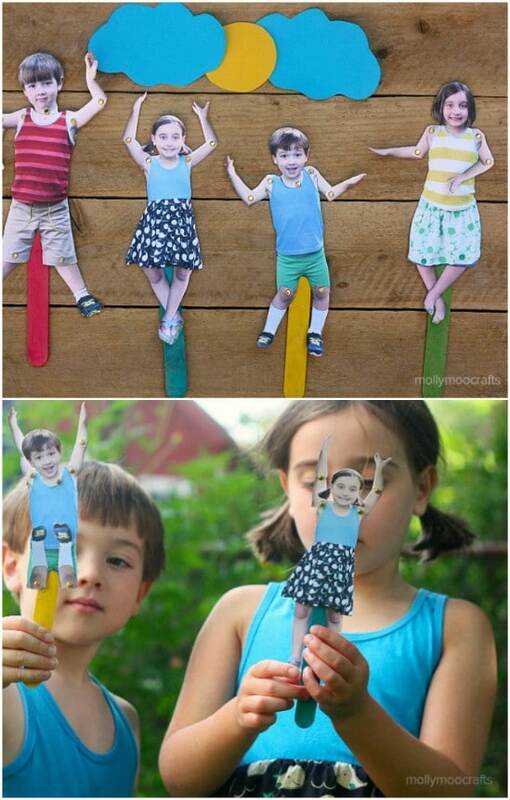 These DIY popsicle stick dolls are a great example. They just take those craft sticks and then paint them to resemble their favorite characters. They could make these in any number of styles and decorate them with yarn, paint or any other type of embellishment. Not only are these little harmonicas that you make with popsicle sticks cute, they are functional. Your little ones can decorate their own harmonicas and then when they are finished, they can actually use them to make music! To make these, you need craft sticks, toothpicks, paper, rubber bands, and some stickers or other items for decorating. If you have hockey lovers in your house, they will adore these little mini hockey sticks that you can make from popsicle sticks. You just need some glue and tape to create the colors that they want. You could even personalize these for their favorite hockey team and when they are finished, they can play hockey with them…well, tabletop hockey, but they’ll still love them. Let your little ones create their own bedroom décor with these cute little popsicle stick initial plaques. 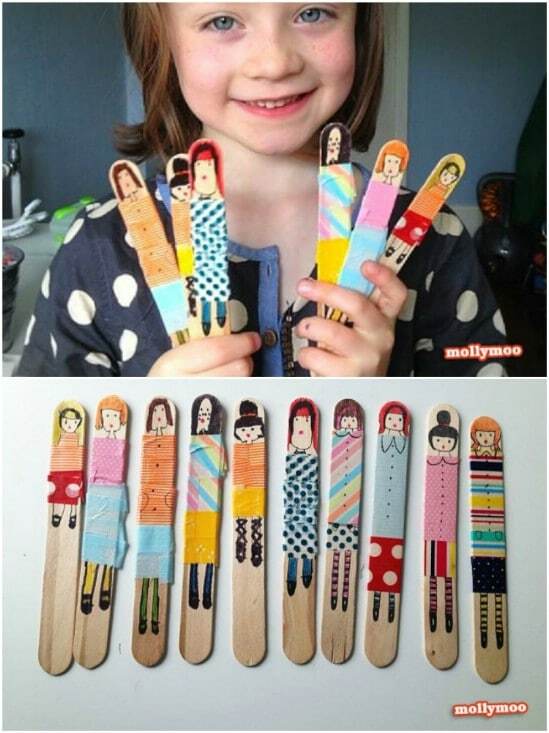 You just need a collection of craft sticks, some glue and some paint to make these. 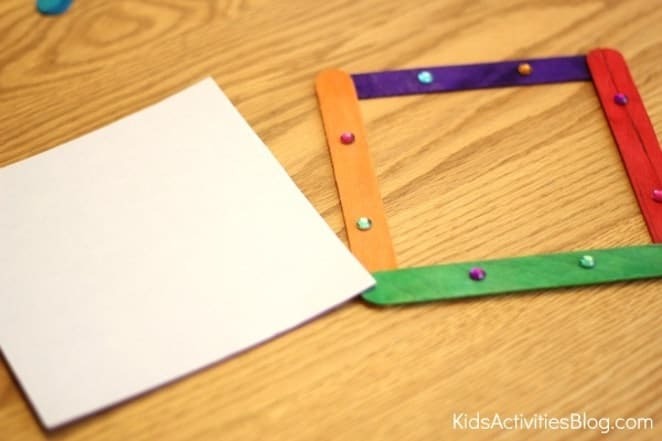 This is a great way to help toddlers and preschoolers practice on making their ABCs and they will love displaying their own initial plaques in their bedrooms. I love the colors in this wreath that your kids can make from popsicle sticks. You could let them do these to decorate their bedroom doors – maybe even add in their initial in the center – or let them make a colorful wreath for your front door this summer. The color choices are endless. They could do bright watercolors or even do a nice red, white and blue for the Fourth of July, and you can add this to your list of DIY Fourth of July decorations. This DIY abacus that you make from popsicle sticks is not only a great summer craft for the kids, it’s also a great learning tool for toddlers and preschoolers. Once you have the abacus made, they can use it to help them learn to count. 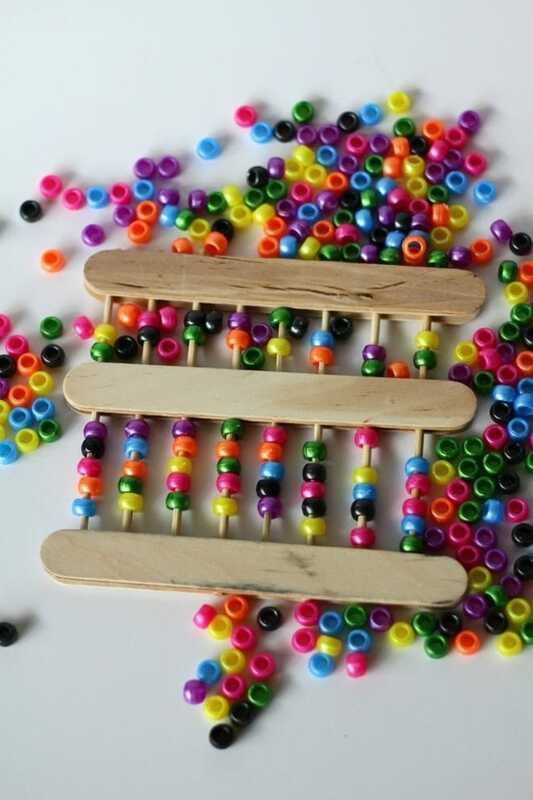 It’s an easy project that you make with popsicle sticks, plastic or wooden beads and bamboo skewers and you can get all of the supplies at any craft or hobby store. 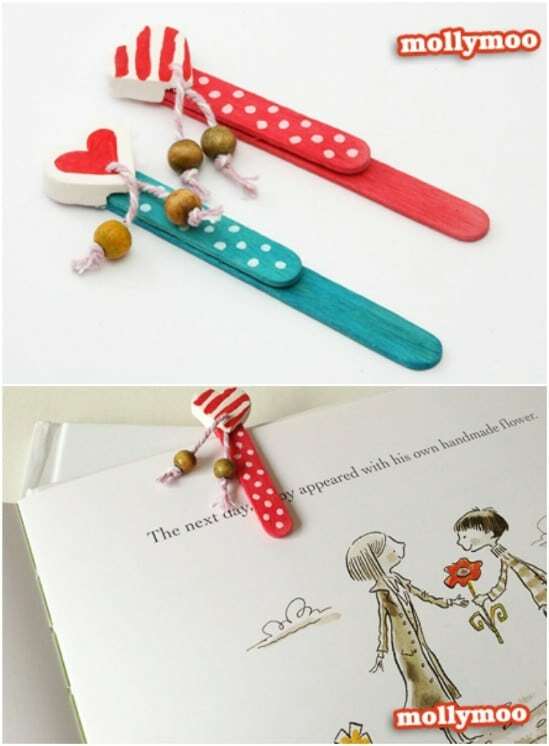 Help your kids enjoy reading this summer with these adorable clip on bookmarks that you make from popsicle sticks. The fun part of making them is that they can decorate them however they want. Plus, it helps encourage them to spend some time this summer reading and these make wonderful gifts that your little ones can make for grandparents, parents or even their little friends. These little boomerangs that you make with popsicle sticks are so much fun. They don’t actually explode but they do come apart once they hit their target. 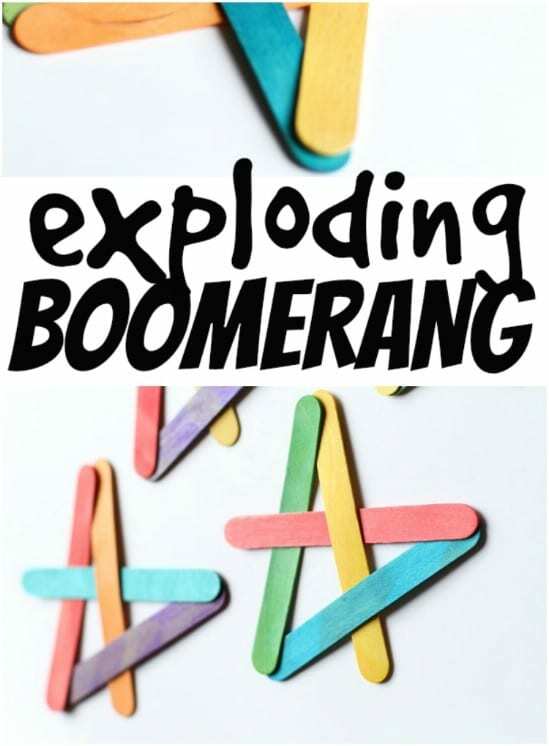 Now, they won’t return to your kids like a regular boomerang but they will still have loads of fun playing with them. They can paint and decorate them however they want and then spend hours outdoors playing with them when they are finished. Remember those old fans that you used in the summer when you were younger? They were so much fun and these DIY versions are just as much fun. 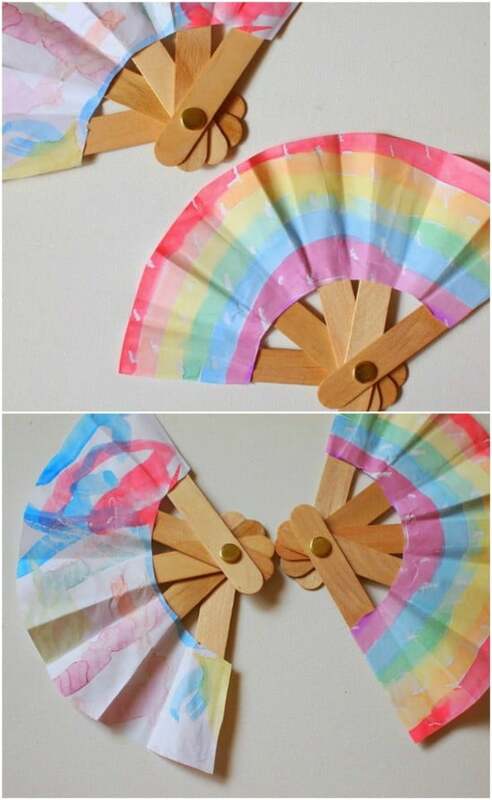 Plus, they make a fan so your little ones can use them to help them cool off this summer. These are made with paper and popsicle sticks and they simply couldn’t be easier. Plus, your little ones can decorate them however they want, which just adds to the fun of creating them. I love teaching my kids about gardening. They enjoy learning about different plants and even watching their own plants grow each year. That’s where these adorable DIY garden plant markers come in. Help your little ones to make their own plant markers and then watch as they enjoy nurturing those plants all spring and summer long. These are super easy and so much fun to make. 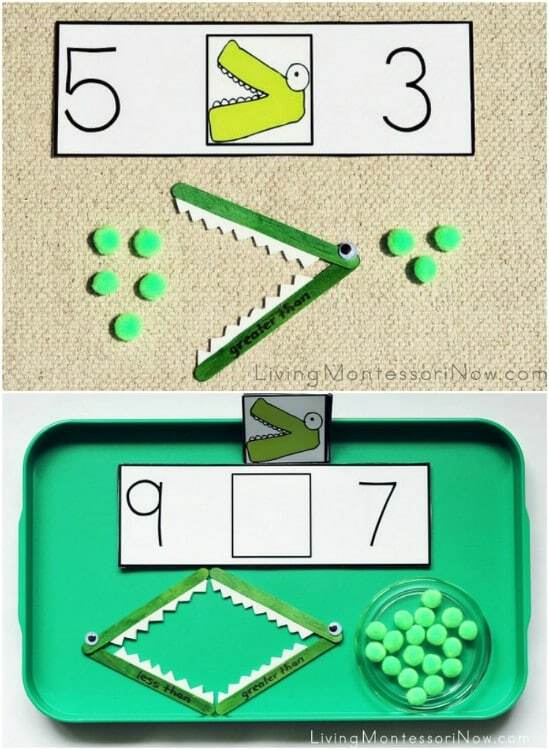 Take a few popsicle sticks, paint them green and then glue on foam teeth to create this fun game for preschoolers. This game is based on the Montessori method of learning which is really popular and it helps to teach your little ones math. Not only will they love making the game with those popsicle sticks but they will enjoy learning from it just as much. 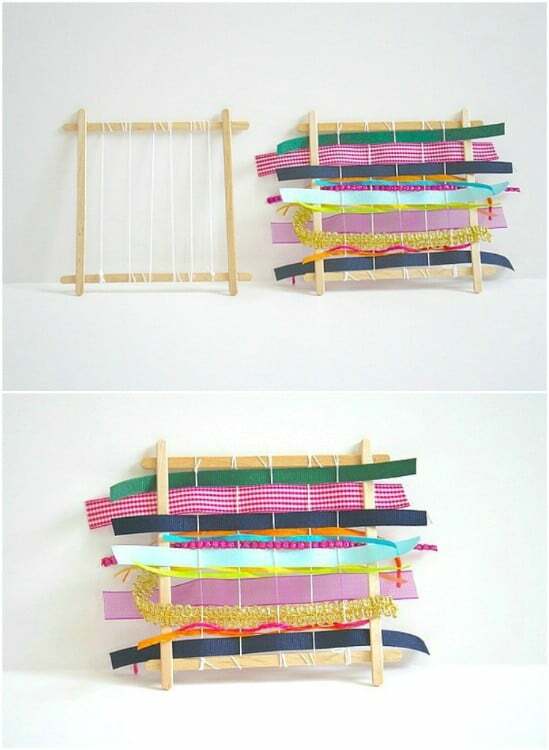 This DIY weaving loom is really easy to make and once it’s finished, your kids will have loads of fun creating other things by using it. When the loom is done, they can use anything from yarn to leftover fabric scraps to create so many wonderful things. Weaving is a great learning experience too and it helps to teach toddlers about the different textures of fabrics. 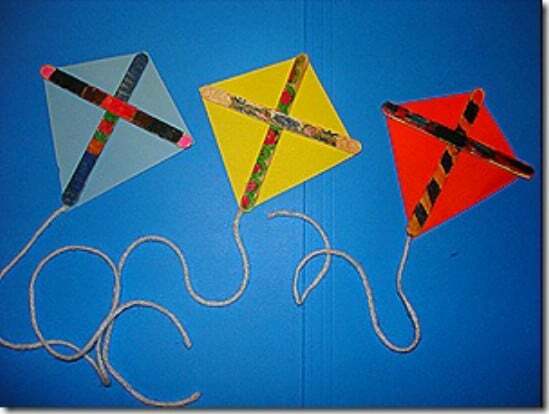 Kids love kites and they will really love making their own little kites from popsicle sticks. These are so much fun to make and decorate and they could even fly them when they are finished. They will want to fly them indoors, as they are really small and probably won’t hold up well in the wind. But, you could have a ball playing with them indoors on rainy days. I really do love fun craft projects that double as learning tools. 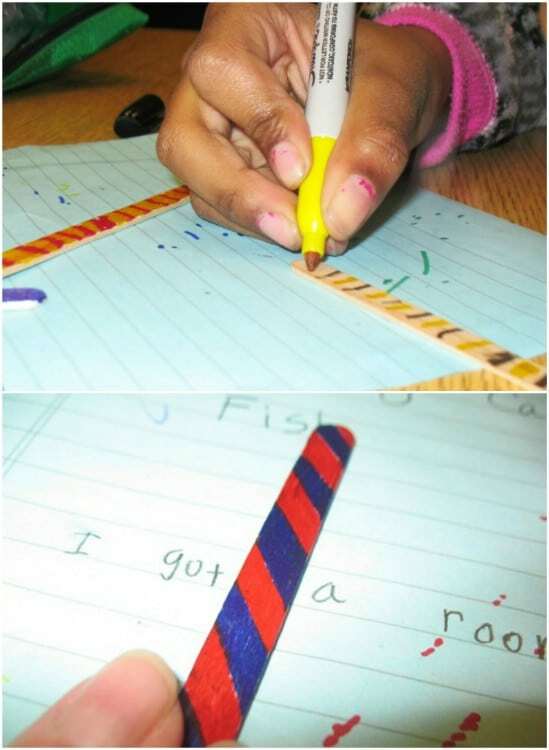 These DIY word spacers can be made with popsicle sticks and they help your early learners to put legible spaces between their words when they are writing. These are great for summer learning sessions and they will be perfect for taking back to school with them in the fall. 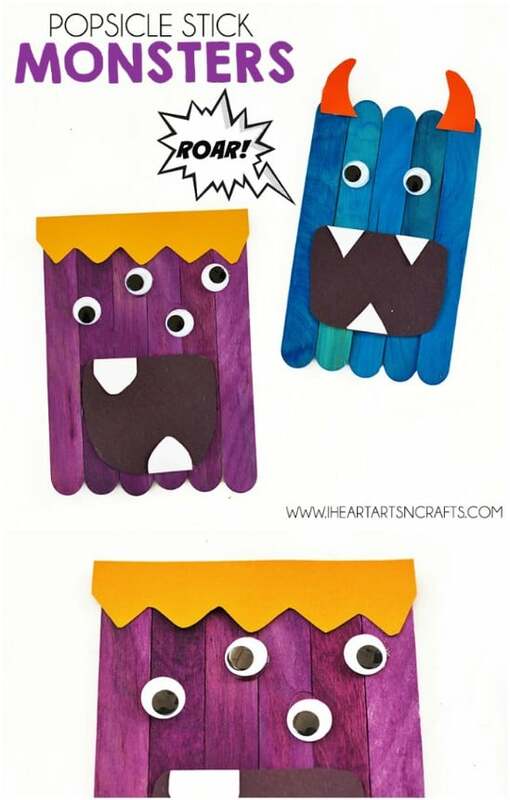 These little monsters are anything but scary and your kids are going to adore making them with you. You use a few popsicle sticks to make each one and then let them use their own imaginations when it comes to coloring and decorating them. They will have hours of fun playing with these or they could use them to decorate their bedrooms. My kids loved putting on puppet shows when they were younger and yours will love it too with these DIY movable puppets that they can make with popsicle sticks. They can add images from magazines for the faces or you could print off photos of them and let them make their own little family of puppets. These are so much fun to make and even more fun to play with when they are finished. 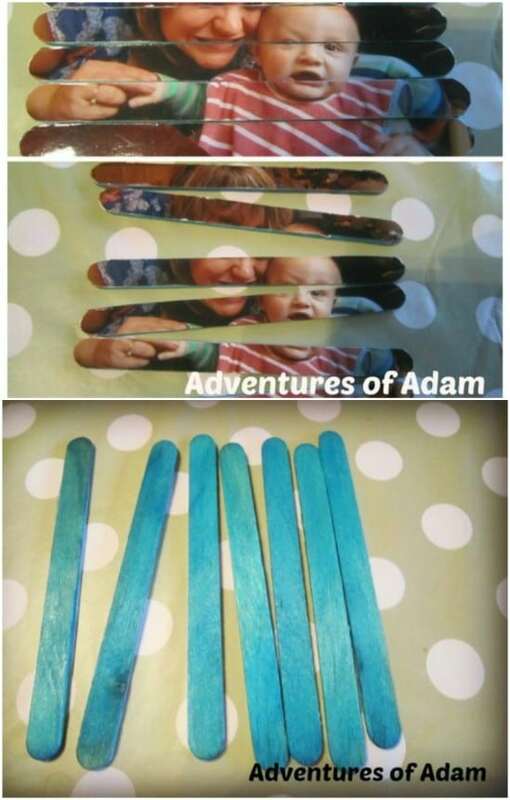 For these popsicle stick puzzles, you print off images – whatever images you want -and then turn them into easy to manage puzzles for your toddlers. You can use images of your family or their favorite characters. Go to the Disney website and print off Mickey and Minnie pictures to use or use whatever images they love. They will have hours of fun putting together these little puzzles and they are a great teaching tool. 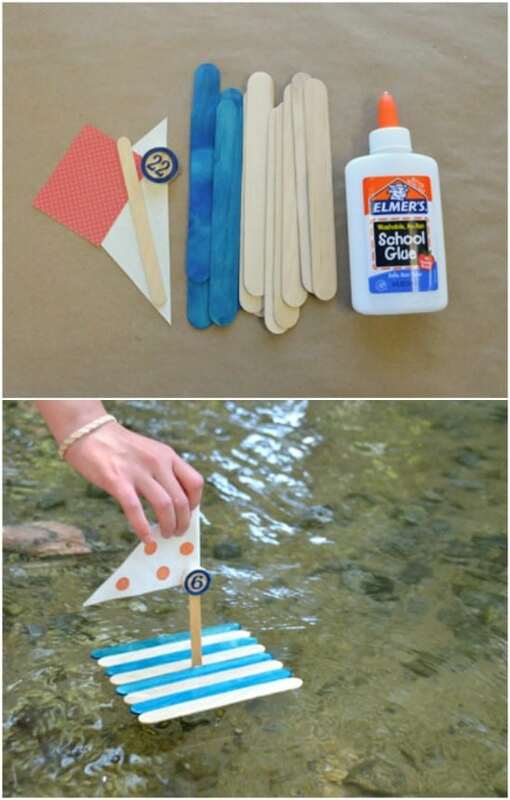 Summer is a great time for water play and your little ones will adore making their own boats from popsicle sticks. These float really well and are perfect for those hot days when they really want to play in water outdoors. The boats are super easy to make, even for your toddlers and preschoolers and they will love decorating them all by themselves. 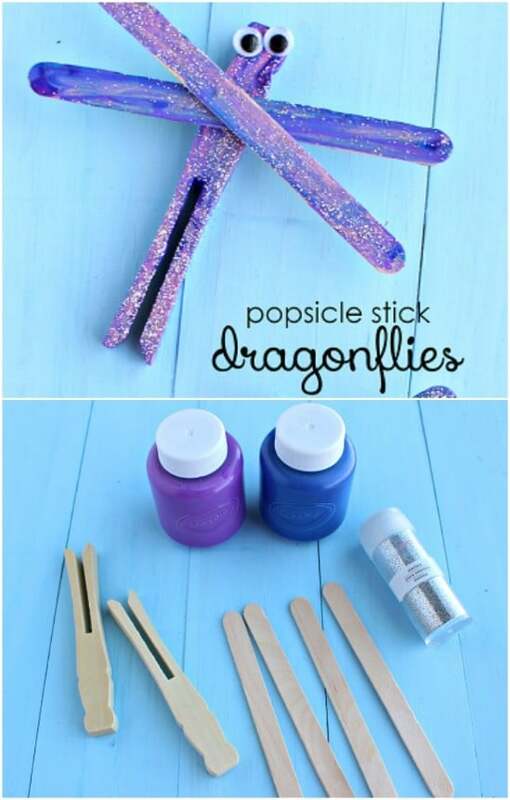 These little dragonflies are made with popsicle sticks and they are so adorable. Your little ones can put them together and even paint them with glittery paint to make them even more fun. These are great for outdoor play or they could use them to decorate any number of things from bedroom walls to DIY wreaths and other summer themed décor. If you have a rainy day this summer, these little popsicle stick easels will help your kids to fight boredom. They can make a number of little easels for displaying their artwork and then create the artwork that they want to display. 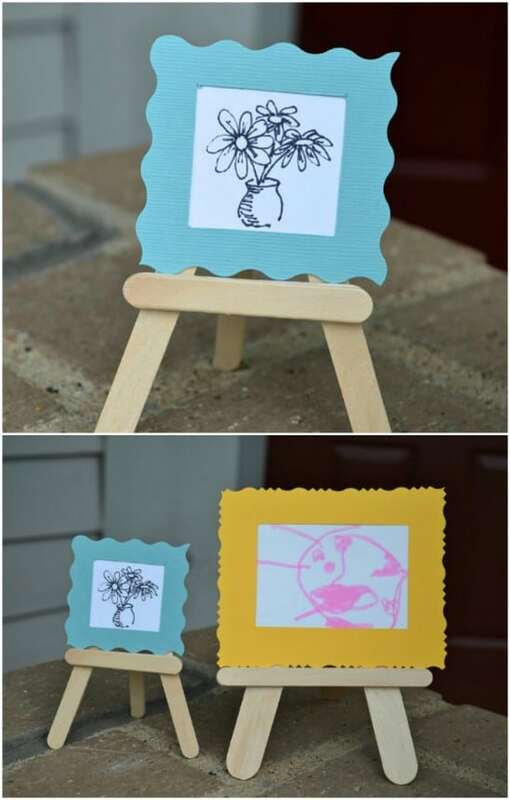 These are super easy to make and even your toddlers will enjoy creating artwork and showing it off on their own tiny popsicle stick easel. Kids love fairies and fairy houses and they can create their own little fairy garden, using a popsicle stick as the door. 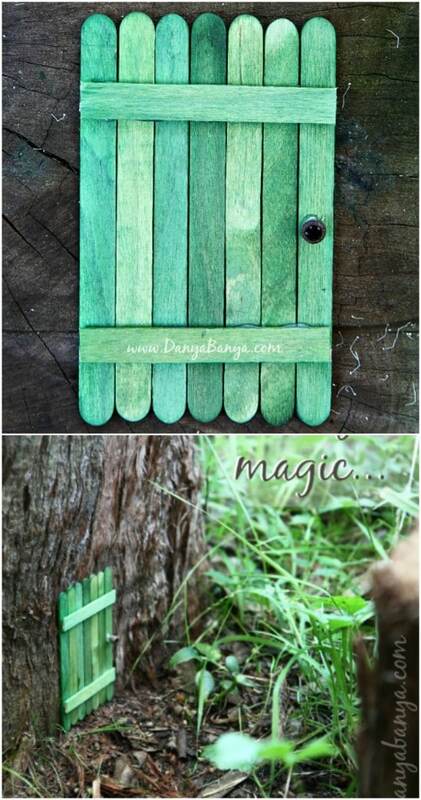 This DIY fairy door can be added to your DIY fairy house or you could simply attach it to a tree base or stump to look as if a fairy lives there. If your little ones love creating their own DIY fairy house décor and furniture, this is the perfect door to go along with them. 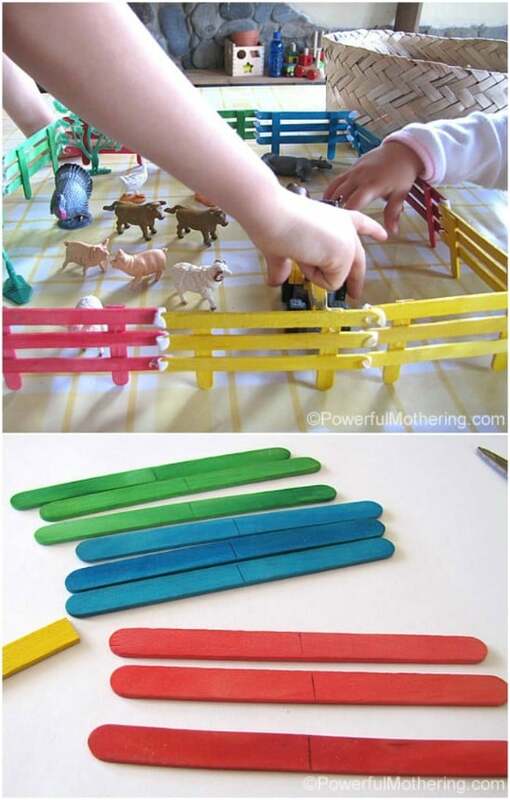 This DIY fence that you make from popsicle sticks is perfect for barnyard play. This would also be great for a little fairy garden. Just let your little ones paint their popsicle stick fences any colors that they want and they can use them to keep those barnyard animals corralled. This is also a great way to teach toddlers about colors and putting the fence together is a great hand eye coordination activity. 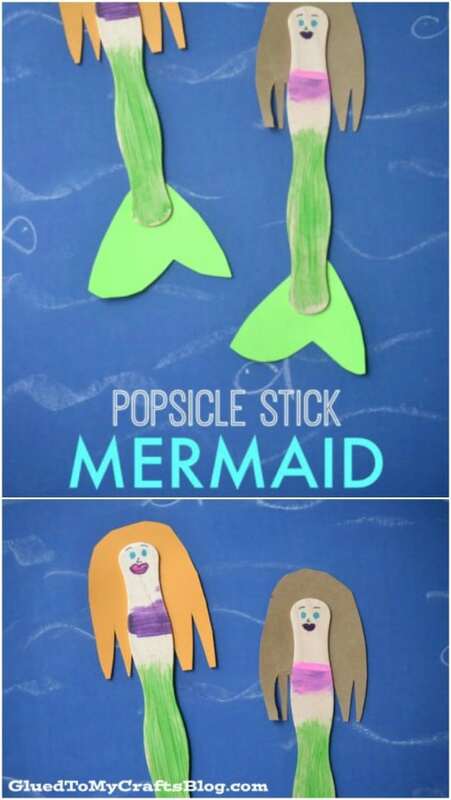 If your little ones love The Little Mermaid then they will really love these tiny mermaids that they can create from popsicle sticks. Not only is this a fun craft, it’s also a fun playing activity once they have created their little mermaids. These are super easy and offer so much room for imagination. Your kids will adore picking out their mermaid colors and designing them all on their own. Let your little ones create their own DIY Mother’s Day gift for you or for grandmothers with this cute little popsicle stick craft. They just use the sticks to make a house and then they can decorate the house with construction paper, glitter, buttons or any number of other colorful embellishments. This is a great way to give them the joy of gift giving. These colorful popsicle stick patterns give you a great opportunity to teach toddlers and preschoolers about color patterns. They just paint the sticks the colors that they want to use and then attach them in specific patterns using tape. It’s a wonderful teaching exercise for colors and for counting. They can count out how many blues they want for instance and then add reds, greens, or any number of other colors. These little vases are so easy to make and depending on the ages of your children, they may be able to do them all by themselves. They just paint the popsicle sticks whatever colors they want – they could also use markers – and then line them up against a glass or small vase to create the design. These are super simple and so much fun to make and it gives your little ones the opportunity to provide you with adorable new home décor. When my son was younger, he absolutely adored Scooby Doo. If your kids love that whimsical pup then they will really adore these Scooby Doo dolls that they can make from popsicle sticks. They just have to paint them the various Scooby Doo character colors and they could even draw on faces if they wanted. These are super fun to make and to play with when they are finished. 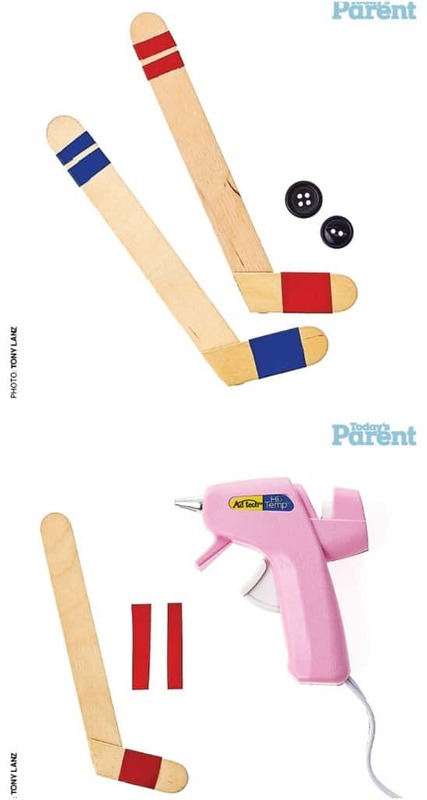 Here is another great popsicle stick craft that gives your little ones hours of play time when the craft is finished. 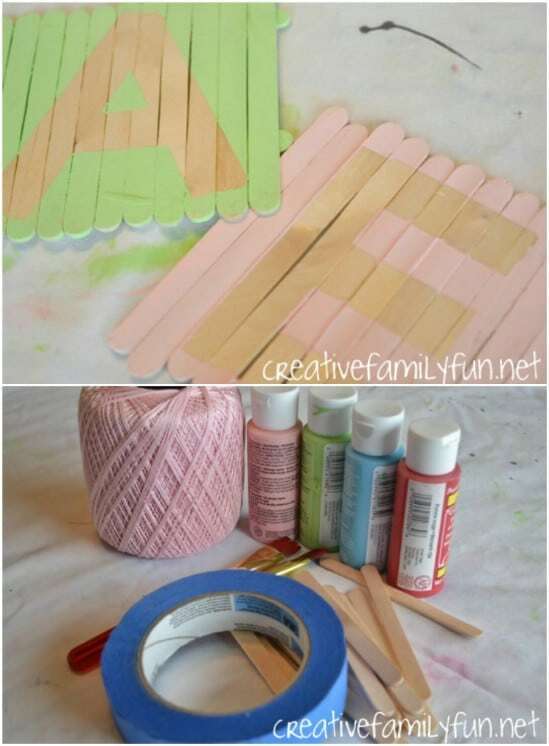 By painting popsicle sticks different colors, you create a Jenga type of game. Once the sticks are dry, you just stack them as high as you want and then when you are finished, just remove the bottom stick to watch them all come crashing down. 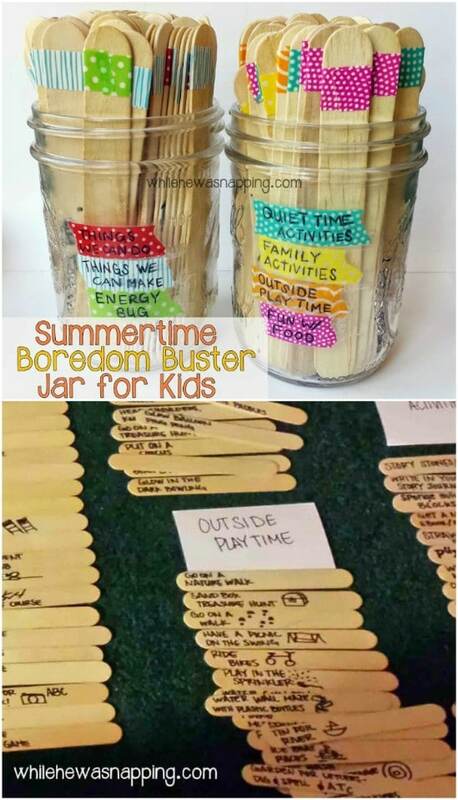 An empty mason jar and those popsicle sticks are perfect for beating summer boredom. You just let your kids create any number of activities and then print them out on popsicle sticks. They can even decorate their sticks with washi tape or fabric scraps. Each stick contains a different activity and when they get really bored, they can pull out a stick for an activity that the entire family can enjoy together. This is also a really cute DIY mason jar decorating project. 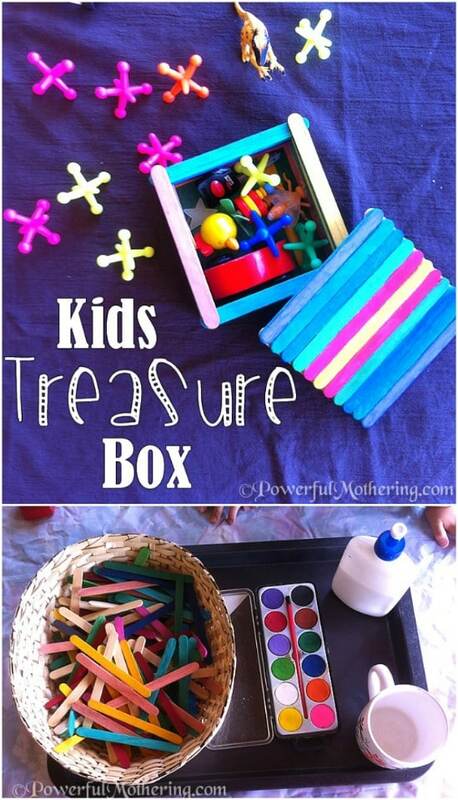 Treasure boxes are so much fun for little ones. Not only will they love keeping their treasures in these little boxes, they will adore creating their own treasure box from popsicle sticks. You can use any number of paint types or colorful tape to help them create their design and then they just have to glue all of the sticks together to make the box. It even has a lid to keep their treasures hidden away. A collection of popsicle sticks and some Velcro dots are all you need to create the perfect building sticks for little ones. These are super easy to make and so much fun when they are finished. 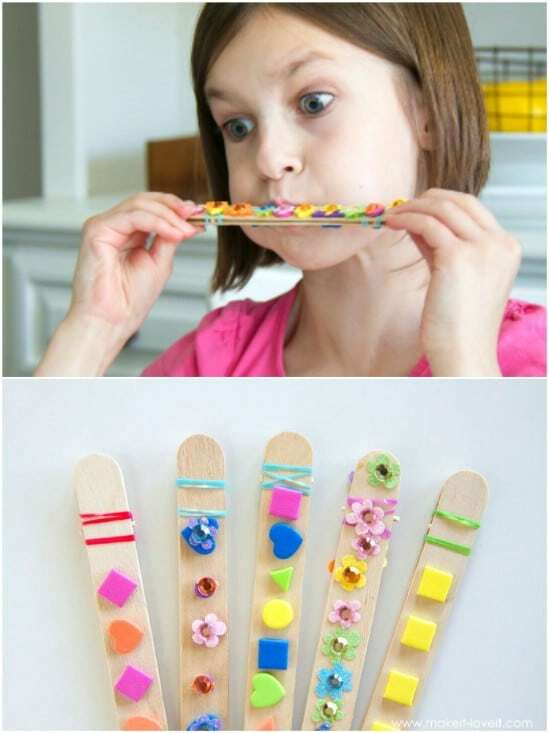 Let the kids help you to paint the popsicle sticks in an assortment of bright colors and then they can help place the Velcro dots, which helps to keep the sticks in place while they are building with them. 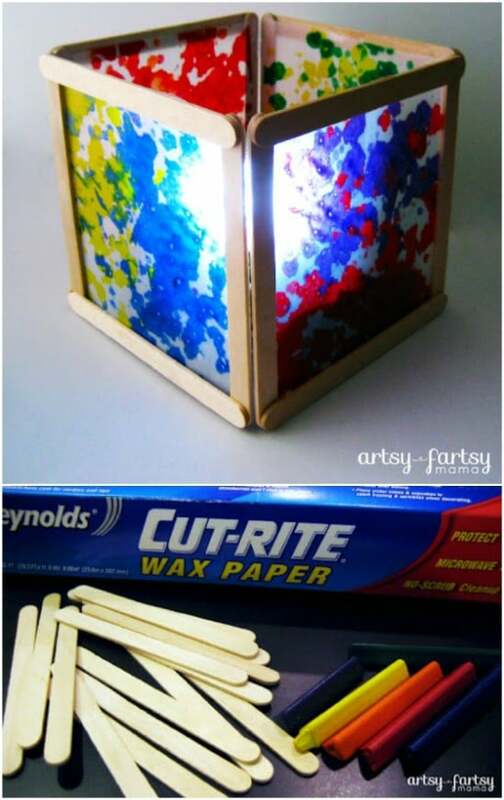 Just a few basic craft supplies, including a few popsicle sticks and some wax paper will give your toddler the makings for these fun and adorable little lanterns. They will love creating these and displaying them when they are finished. This is also a good way to teach your little preschoolers about colors and putting the lanterns together is a great hand eye coordination activity. How cute are these little caterpillars that your kids can make from popsicle sticks? 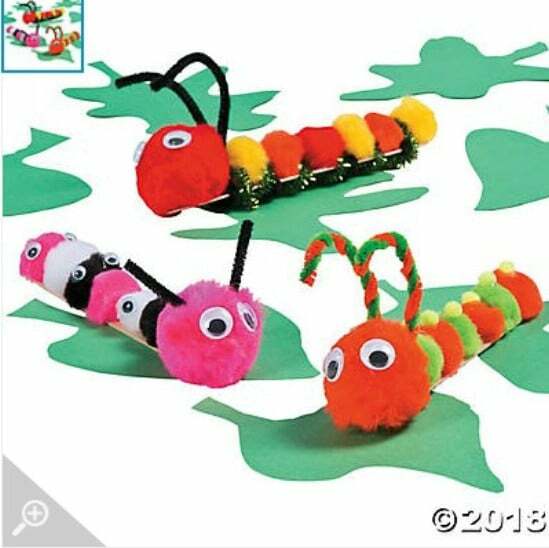 They are so easy to do and they can design their caterpillars however they want. 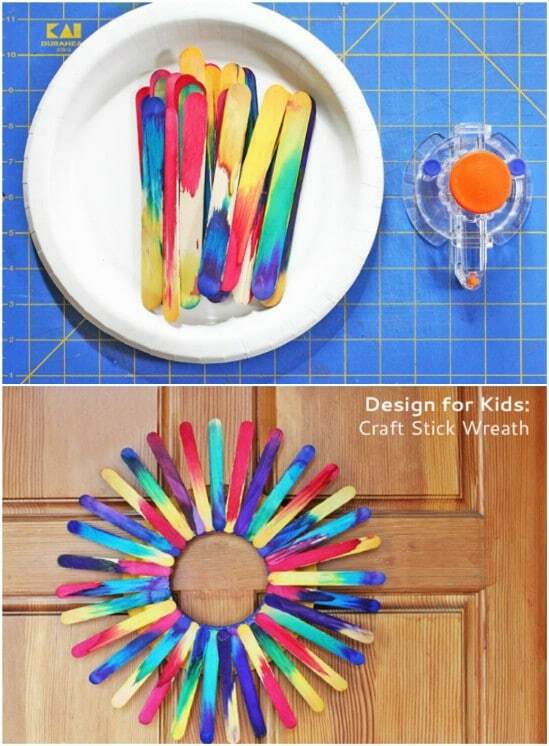 You just need a popsicle stick and pipe cleaners for each one that they want to make. You will also want some google eyes and glue. Wrapping the pipe cleaners around the sticks is great for teaching them coordination and they will adore watching their little caterpillars come to life. Remember going to summer camp and making these adorable God’s eyes? I do and your kids can have the same fun with this popsicle stick project. To make these, you just need some colorful yarn and a couple of popsicle sticks for each one. Once these are made, they can hang them to help decorate their bedrooms or anywhere that they want to add some color. 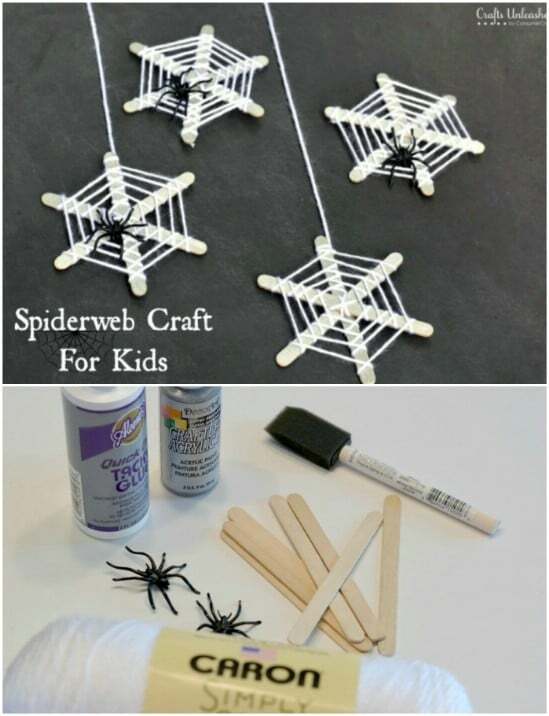 Kids will love these little spiderwebs that they can make from popsicle sticks. You just help them to paint their popsicle sticks white and then use white yarn to add the web effect. These are really great for Halloween decorations but they can make them in the summertime too. This is also a great nature craft and is a good opportunity to teach your kids about spiders and which ones they should avoid. This may be my favorite popsicle stick craft ever. 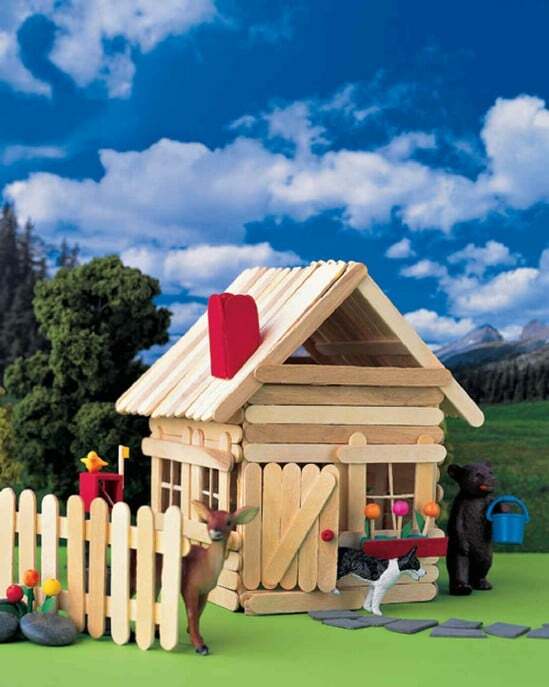 Kids will really love building their own little houses from popsicle sticks. They don’t even have to paint or color the sticks, although they can if they want them to be more colorful. What a great craft for summer! This one is perfect for rainy days and once they have their houses built, they can play with them all summer long.